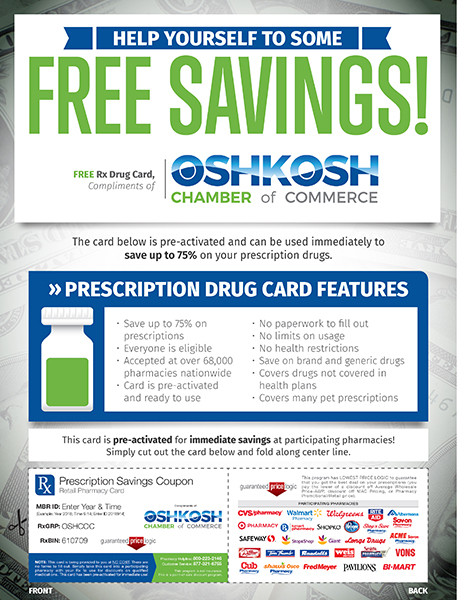 The Oshkosh Chamber of Commerce in partnership with United Networks of America will now offer members an Rx Prescription card to be used at several pharmacies. This program makes prescriptions more affordable for the uninsured and the underinsured, and can be used to supplement most health insurance plans. Membership to the UNA Rx Card program is completely FREE. No personal information is required to join and there are no enrollment forms, no eligibility requirements, and no restrictions of any kind. Through this program members can receive savings of up to 75% at more than 68,000 national and regional pharmacies. You may download your card here. Cards may also be picked up at the Oshkosh Chamber office at 120 Jackson St. The cards will also be mailed out during the month of October. Find a pharmacy.